Hello Friends! I started out the week with such great energy. Delighted with baby June and delighted for the last week of school. But I discovered on Wednesday that I’ve been pushing too hard too fast and the pushing has slowed down my healing. (Dumb me. I should know better.) So yesterday, I stayed in my pajamas all day long to prevent me from leaving the house. And today, I only slightly upgraded to yoga pants — I’m feeling much better already. While I rest up and snuggle my little bundle of baby, here are a few things I’ve been wanting to share with you. – The Green Bag Lady has given away over 10,000 hand-sewn grocery bags to recipients who promise to use them instead of disposable ones. Update: She’s giving away Ten Bags to Design Mom Readers right now. Enter through Monday. – How sweet is this Ruffle Pillowcase dress? – Oooh La La! French Crafters. – This sounds lovely. Chefz Table offers in home cooking classes from local chefs. Would you try this? – Ummm. Is that divider built out of garden hoses? It looks awesome! – I adore Sea Bags. You can win one here. – I love this article. A company in San Francisco makes compost-able diapers. And also composts them! Thanks Molly. – Baby monitor via iPhone. Has anyone tried this? – Really good looking indoor climbing tree. – Stephanie is having her big neck surgery today. Send prayers. – Tips on how to make a Family Mission Statement. Thanks Jade. – How great is this shirt?! – Do you like rhubarb? Me too. – Thing I’m most excited about today: a new episode of Friday Night Lights. If I haven’t told you already, please know how much I love getting to share our new baby with you — the pregnancy, the birth, her photos. You all say the sweetest things and it makes the whole experience all the more wonderful. Thank you. Have a fantastic weekend. I hope you get some rest. I will try too! In the meantime, you can picture me exhausted, but happy. For those of you in my area, Happy Last Day of School! The kids are making a huge batch of fresh lemonade to welcome summer vacation. What are you doing? 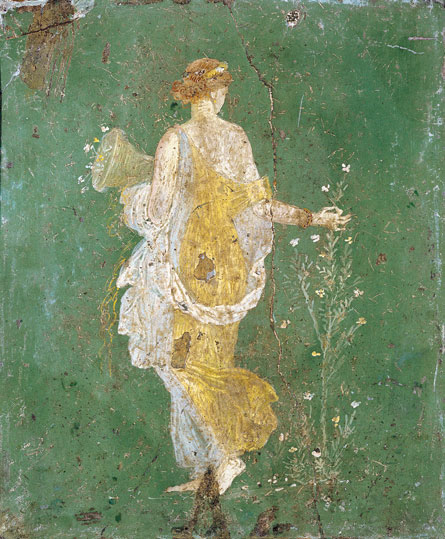 PS — The image at top is the fresco fragment rescued from Stabiae, near Pompeii, an image both destroyed and preserved by Vesuvius, one thousand nine hundred and fifty-one years ago — Flora gathering flowers, herself a fairer flower. We are still loving Flora June’s name. Thanks, David, for sending the image! Please get some rest! Thanks for all the fun links, I already know I’m going to have fun browsing. Yay for FNL – Be well and be sure to take good care of the one who takes care of everyone else! It’s easy to forget that you need rest when you aren’t encumbered by a baby belly. I wish for you a long and very relaxing weekend. Thanks for all of the fun links and Roman is just beautiful! We purchased the baby monitor app by Jindrich Sarson and it rocks! We use this app when over at friends and the baby is asleep. It has a ton of different setting. Anyways if you want more info. Let me know! I love FNL’s!!! Why hasn’t it done better? I don’t understand. I love your site, especially on Friday’s! Thanks for all the wonderful links. Hello .. while you take care of everyone else , it is most important that their mother gets plenty of rest. Don’t deprive yourself of it. The body takes a while to heal ..hope you get plenty of rest in the days to come. Thanks for all the links. Well, I do miss it when you don’t post, but it’s no fun to have a setback in your recovery because you do too much too soon. I hope you have a wonderful, relaxing weekend with your family and your newly-liberated children. Just saw baby Roman’s post-surgery picture before stopping by here – so glad he is doing well. Thanks for the shout out. I have posted a Design Mom freebie so 10 winners can get bags! Excellent. Stay in your jammies all week I say. Thanks for all the fun stuff! And – yes, stay in your yoga pants (they were like my uniform for weeks with my fourth baby – and you have six now, right?). Congrats and thanks again. I second the ‘stay in the jammies’ route. I had to do that this past Monday. Too much weekend ‘nesting’ – woke up with contractions – called in to work – changed back in to my pajamas! This weekend I vowed to take breaks – thanks for helping by providing break-time entertainment! I love pajama days! I had one just yesterday (and blog surfed while I was at it)! Maybe we moms should designate one day a week to PJs…and a super cute pair at that! Take it easy! You know that Ben will do whatever you need for him to do! Just make sure that you give yourself “healing time”. Please stay in your p.j.’s for as many days as it takes! Seriously. I learned the hard way with my last baby. I thought I could do it all – run the other kids around, take care of everyone else in the neighborhood, sell the house and move, etc. (you get the picture). I neglected myself in all of that mess, and ended up losing my milk. I tried everything to get it back. I realized that I hadn’t been taking the time to enjoy this precious little gift of a baby. He is one now, and I really am enjoying him (and my other children too!!) Thank you for sharing your life with us – it is funny how you think you know someone, just from reading their blog. Take care of yourself – and I think you can use the excuse “I just had a baby” for the entire first year! !